Please write me a message! Please feel free to contact me via the contact form at the bottom of this page with any questions or information in regards to the 9th Infantry Division or this website. To make a voluntarily donation for my research, please use the below button. Your contribution will be used for 9th Infantry Division in WWII research only. – 9th Infantry Division related uniform/equipment/insignia items. Find a more detailed description here: What to contribute? If you have any of the above, please contact me. I can surely use things like these for my book or to complement the website to make the information about the 9th Infantry Division even more complete here. I appreciate any help. If you know a veteran who would like to get in touch with me, please let me know. I can also write a letter, call, or provide my home address. Please use the contact form down below to contact me. For some years now I have been helping family members to information about their father, grandfather, brother, uncle or great uncle who served in the 9th Infantry Division. So far, I have been in touch with over 450 families of 9th Infantry Division soldiers, and have been able to provide information to most of them. 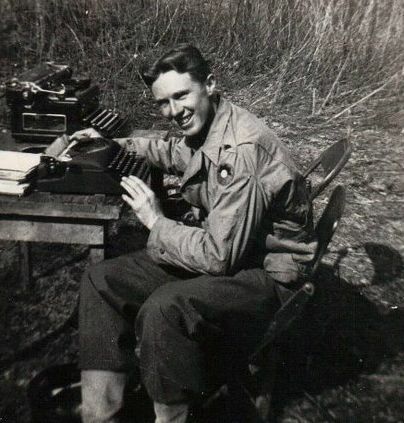 It often happens that after one of these fine veterans passes away, objects or pictures are found, indicating they have served with the 9th Infantry Division during World War 2. For the family it often is a difficult and time consuming task to find out more about their loved one. Over the years I have built up a large database of information about the 9th Infantry Division and often I can share information about the veteran, his unit, the actions he participated in, or pictures of the former battlefields or the grave of a soldier. I will provide a package of information with details and information which is easy to read, print out and share. All I ask for is a small, voluntarily donation. Please know that sometimes it is hard to find any information, and I might not succeed in my search for information. If I can’t help directly I can surely help in pointing out the right direction to continue your own research and how to obtain official service records, unit information, medal citations or any other relevant information. So please contact me if you have any questions about a soldier, unit or actions, and I will do my best to provide the help needed. Just fill out the contact form down below to contact me. As you can see I have several Tribute Pages on my website. If you would like to see any of your loved one on one of these pages, please let me know. I will be honored to create a tribute page for any of the 9th Infantry Division veterans and learn more about their lives. All I need is a short story about his life before, during and after the war. If you have pictures that can be used as well it would be great to have those on the tribute page as well. The more information and pictures, the better the tribute page looks, so please sent any information available. When given permission, I might also include these tribute pages for the book I am writing. Please use the contact form down below to contact me. Here are some testimonials about my research work that you can read. GDPR Data update on using our Contact Forms: Should you choose to contact us using the contact form on the Contact Page (https://9thinfantrydivision.net/contact/), none of the data that you will supply will be stored by this website or passed on to or be processed by any third party data processors. Instead, the data will be collated into an email and sent to the webmaster over SMTP (Simple Mail Transfer Protocol). This means it will go directly to the webmasters encrypted inbox, and will only be used / viewed by the webmaster.